Uses Because holly is only available in small sizes and quantities, it's used for fancy turnery and inlays in furniture. Also used for picture frames, and parts of musical instruments. Formerly used for carving engravers blocks and for inlay work. Leaves were used as winter food for stock. 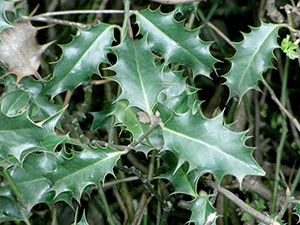 Holly in Scotland Grows well in Scotland, often as an ornamental tree, but also in hedges and some woodlands. Not widely available, and when it is available sizes will be small, up to 8 inches wide in lengths unlikely to be greater than 5 feet. Density 780kg per cubic metre at 12% moisture content. Durability Classified as perishable. Tendency to distort on drying—kiln drying not recommended. Structure Diffuse porous with a fine even texture. 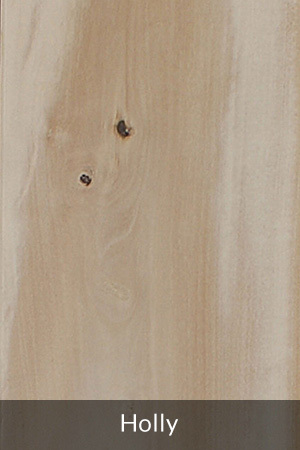 Colour and Figure White or greyish white, sapwood indistinct from heartwood, grain tends to be irregular. Working Properties Moderate blunting, some tendency to char and burn on sawing. Reduced cutting angle for material with irregular grain. Turns well, stains and polishes well. Looks and Leaves Generally a small tree, about 9 metres in height with a conical shape. 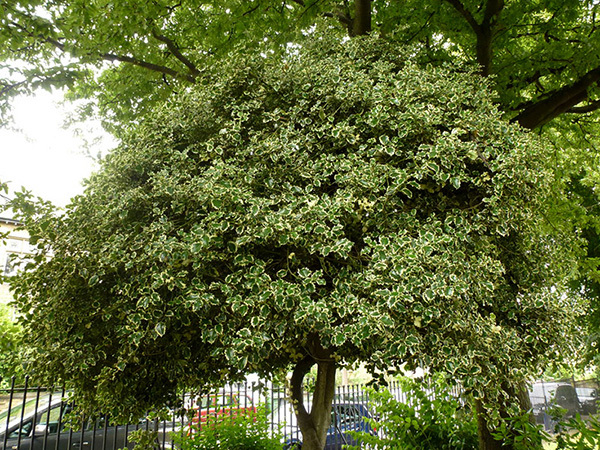 Almost everyone is familiar with the smooth dark green leaves of the holly tree. They are simple, alternate, between 3 and 10 cm long and elliptical oblong in shape. They have a wavy and spiny margin—Smooth grey bark, becoming fissured. Twigs green and hairless - leaves alternate, simple 3-10cm long, elliptical oblong; have wavy and spiny margin—on old or strongly shaded trees the leaves will have only a terminal spine. They are dark green, glossy above, pale underneath and hairless, with short stalks, small black stipules. Insect pollinated flowers open in May and June: they are about 6mm across with white petals and grow in axillary clusters. Usually there are separate male and female flowers, with the female ripening to scarlet berry-like fruit. Seeds germinate only in the second or third spring after shedding. Habitat Holly is a native tree, not particularly fussy about soil type, although more abundant on the west coast than east, where it may suffer frost damage in very cold winters. Holly will grow in the shade in oak or beech woods. 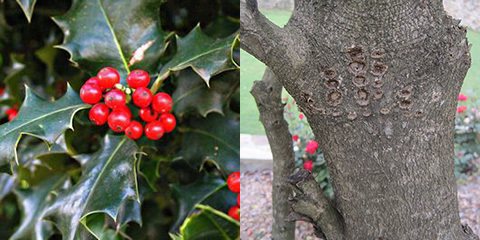 Ecological Value Holly is an excellent tree for the food chain; holly attracts butterflies (brimstone, small tortoiseshell) and holly blue caterpillars feed on buds and young berries before pupating on the leaves. Holly berries are much loved by birds, particularly blackbirds and mistle thrushes—the latter actively defending a good holly tree. Other birds that feed on holly berries include redwings, fieldfares, robins, black caps and song thrushes.